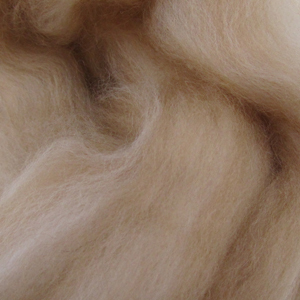 ﻿ Camel Fibers from Weaver Creek Fibers, wholesale purveyors of luxury fibers. This 50/50 combination of Baby Camel and Merino Top is delicately soft and sports a staple length of approximately 5 inches for magnificently soft spinning. It over-dyes beautifully. Camels may be creatures of the desert but they need a downy undercoat to keep the suns rays away from their tender skin. Camel down has been prized for centuries and in modern times was in every gentleman's wardrobe, in the quintessential Camel Hair Coat. Bactrian camels have two humps, weigh about 1600 pounds and stand about 7-9 feet tall at the top of their humps. Their gestation period is 370-445 days and give birth to calves weighing 80-130 pounds. Their life span is 40-50 years. Bactrian camels have two coats: the warm inner coat of down and a rough outer coat which is long and hairy. They shed their fiber in clumps consisting of both coats and is normally gathered. They produce about 5 pounds of fiber annually. Camel down is the soft warm inner down of a bactrian camel with a fiber structure similar to cashmere. The down is usually 1-3 inches long with a micron count of about 15-22 microns. Camel down does not felt easily. Baby Camel Top has been becoming more popular every year. We offer Baby Camel Top blended with Merino and which can capture the attention of hand spinners who seek a luxury fiber at a low price. It has a staple length of over 5 inches. The light color of this Baby Camel Top also will appeal to dyers. Merino sheep are known for their dense fine wool with lots of crimp, making for a soft and bouncy yarn. It takes dye very well and on its own is prized for softness and in blends with our other luxury fibers makes for a perfect companion. The Merino breed originated in Spain and quickly took hold around the world. Some of the very finest comes from Australia.